Richard T. Platt was born in Tucson, Arizona and grew up in Coolidge, Arizona. After graduating from Coolidge High School, he attended Arizona State University and attained a Bachelor of Science degree. He then moved to Spokane, Washington, attended Gonzaga University and the Gonzaga School of Law. He graduated in 1980 with a Masters of Business Administration and Juris Doctor degree. He passed the Washington bar and worked for the Spokane County Prosecuting Attorney’s Office for four years. In 1984, he and his family returned to Coolidge, Arizona. After passing the Arizona bar, he went into private practice with his father, William E. Platt and Dennis Jenson in the firm of Platt & Jenson, PC. During this time he was the Coolidge City Prosecutor and the Town Judge for Florence, Arizona. In 1996, he joined the Pinal County Attorney’s Office as a supervising attorney. In 1997, he was appointed the Chief Criminal Deputy County Attorney by County Attorney Robert Carter Olson. He held that position until the end of 2012. In 2013 through October, 2015, he was in private practice in Coolidge, Arizona with his father and his niece, Melanie Merritt. In October, 2015, he accepted an appointment as a full-time Court Commissioner / Judge Pro Tem of the Superior Court. He was a board member of the Pinal and Gila Counties legal Aid Society for 7 years. He also served as a board member of the Southern Arizona Legal Aid for 3 years. 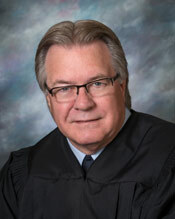 He served on the board of the Arizona Board of Legal Services and Education for 3 years as well. He is also a Fellow with the Arizona Foundation of Legal Services and Education. He served as a member of the Board of Governors of the State Bar of Arizona for 15 years, representing Pinal County lawyers and the public. He served on the Board of Governors In June, 2014, he was elected as President of the State Bar of Arizona and he served until June, 2015. He has served his community by being a volunteer firefighter for 25 years. He was the Assistant Fire Chief for Coolidge for 10 of the 25 years, retiring in 2009. He is a member of the Coolidge Industrial Development Board. He is a past President of the Coolidge Chamber of Commerce and he served many years with the Coolidge Lions Club.